Short-lived British postpunk act The Pop Group — which somehow managed to meld punk, dub, noise and funk — will reunite this September after nearly 30 years apart, with four concerts currently scheduled in the U.K. and Italy and a new studio album reportedly in the works. According to a news release today from All Tomorrow’s Parties — which is putting on Sept. 11 and 12 concerts in London — the band is reuniting for the first time since splitting in 1981 in order “to play a small amount of club dates to ‘blow the dust off the old songs and pick up where we left off. '” The group also is scheduled to play Sept. 9 and 10 in Bologna and Turin, Italy, respectively (see full dates below). 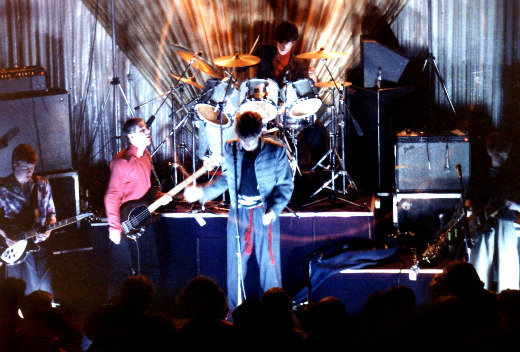 The reunited band features original members Mark Stewart (vocals), Gareth Sager (guitars, keyboard, sax) and Bruce Smith (drums) — the latter of whom has been playing in the reunited Public Image Ltd. this year — as well as Dan Catsis, who replaced original bassist Simon Underwood in 1980 around the time of the group’s second and possibly no longer final album, For How Much Longer Do We Tolerate Mass Murder?